KAIST and the Konza Technopolis Development Authority (KoTDA) announced the official establishment of Kenya-KAIST by 2021 during a kickoff ceremony on February 12 in Kenya. The KAIST delegation headed by President Sung-Chul Shin and Kenyan cabinet members and dignitaries including Minister of Education Amina Mohamed, the Chairman of the KoTDA Reuben Mutiso, and the CEO of KoTDA John Tanui attended the ceremony. With this kickoff held at Konza Technopolis Malili, KAIST, the first and top science and technology university in Korea, will participate in Kenya’s strategic economic development plan with the provision of a turnkey-based science and technology education consultancy for the establishment of Kenya’s first advanced institute of science and technology. KAIST, which won preferred bidder status in consortium with Samwoo and Sunjin architecture and engineering companies, signed the contract with the KoTDA last November. Korea Eximbank will offer a 95-million USD economic development cooperation fund loan to the Kenyan government. 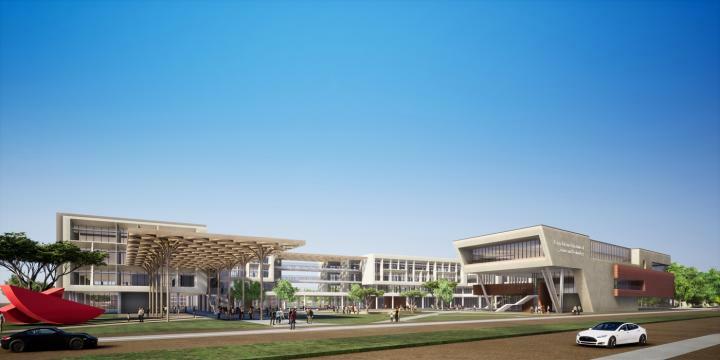 The campus will be constructed in the Konza Techno City located near Nairobi by 2021, with the first batch of 200 graduate students starting classes in 2022. KAIST will develop academic curricula for six initial departments (Mechanical Engineering, Electrical/Electronic Engineering, ICT Engineering, Chemical Engineering, Civil Engineering, and Agricultural Biotechnology), which will lay the groundwork for engineering research and education in Kenya to meet emerging socioeconomic demands. In addition, KAIST will provide education in the basic science areas of math, physics, chemistry, and biology for students. The Kenyan government plans to transform Kenya into a middle-income country under Vision 2030 through the promotion of science, technology, and innovation for national economic growth. Nicknamed Africa’s Silicon Savannah, Konza Techno City is a strategic science and technology hub constructed to realize this vision. To this end, the medium-term plan set a goal to provide specialized research and training in various cutting-edge engineering and advanced science fields. It is also notable that the Kenyan government asked to develop an industry-academy cooperation program in the Konza Techno City. This reflects the high expectations for Kenya-KAIST and its role as a growth engine in the center of the Konza Technopolis. It is anticipated that the technopolis will create 16,675 jobs in the medium term and over 200,000 upon completion, positioning Kenya as an ICT hub within the region. In particular, President Shin was accompanied by Dr. Kun-Mo Chung, a founding provost who served as the Minister of Science and Technology in Korea twice. He now serves as an advisor to Kenyan President Uhuru Kenyatta. Dr. Chung had played a crucial role in securing a six-million USD loan from US AID to the Korean government to establish KAIST in 1971. He proposed the idea to establish an advanced science and technology institute in Korea to Dr. John Hannah, then the director of US AID. The seed that was sowed five decades ago in Korea by Dr. Chung has now fully bloomed in Kenya. In only a half century, KAIST has become a donor institution that passes on science and technology education systems including the construction of campuses to developing countries. KAIST has been acclaimed as US AID’s most successful foreign aid project. A report from the National Academy of Sciences in the US described KAIST as an exemplary case in which a former recipient of international aid has grown to become a science, technology and innovation leader. The kickoff of Kenya-KAIST drew the attention of both media and local universities in Kenya, attesting to their strong interest to drive economic growth through advanced science and technology. The University of Nairobi also hosted a special lecture by President Shin, asking him to share the recipe for the success of KAIST in Korea. In a lecture titled “A Crucial Engine for Rapid National Development,” President Shin presented the vision, innovation, and passion of the Korean people that led to the phenomenal results we can see today. The successful case of KAIST has been benchmarked by many countries for years. For instance, KAIST set up the curriculum for the nuclear engineering program at the Khalifa University of Science and Technology in UAE in 2010. Since 2015, Chongquing University of Technology in China has been running its electrical engineering and computer science programs based on the educational systems and curricula offered by KAIST. Last October, KAIST also signed an MOU with the Prince Mohammad Bin Salman College of Cyber Security, AI, and Advanced Technologies in Saudi Arabia to provide the undergraduate program for robotics. Among all these programs benchmarking KAIST, Kenya-KAIST clearly stands out, as it carries out a turnkey-based project that encompasses every aspect of institution building, ranging from educational curricular development to campus construction and supervision.